1. It’s a great dynamic core workout! 3. Easy, non-intimidating learning environment! You’ll learn how to dance without even realizing it. EVERYONE can take a Zumba® class, whether you know how to dance or not! You’ll drop so many pounds you’ll have to go buy a whole new wardrobe! It’s a comprehensive workout. Your entire body will be reshaped from head to toe! Like I said before, you’ll be having so much fun you won’t even realize your working out. Alberto Perez, a former aerobics instructor from Colombia, founded the Zumba empire in 1999. Zumba began with a series of infomercials peddling the workout on DVDs and grew to include classes taught by instructors who attend Zumba training. 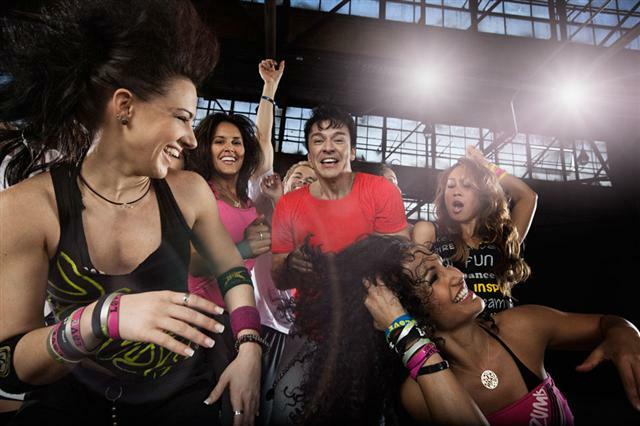 As of 2008, Zumba instructors number more than 20,000 in 40 countries. Zumba classes usually run for one hour and cover a range of dance styles–mambo, cumbia, merengue, cha-cha and, sometimes, belly dancing and hip hop. Zumba training teaches instructors specific guidelines, but gives them flexibility to design classes in their own style. Although a wide-ranging population already enjoys basic Zumba classes, specific classes geared for seniors (Zumba Gold), children (Zumbatomic) and water-participants (AquaZumba) have been developed. Your experience in Zumba depends on the energy of the teacher. If one class doesn’t inspire you to move, try a different teacher–you might jive better with his method. Although the class seems more like a party rather than exercise, you’ll need to wear proper athletic footwear to protect the knee and ankles during twists and turns and to cushion your joints. The amount of calories you burn in a session depends on how hard you work and how much you weigh–but you can realistically burn 500 calories or more in one hour. Because the dance moves are fun, you forget you are working your abs and back by isolating the hips and twisting your waist. Instead of dreading the daily slog on the treadmill, you might find yourself looking forward to a workout that seems like a party with a bunch of friends. When you enjoy working out, you are likely to stick to a routine and reap the health benefits of regular exercise.